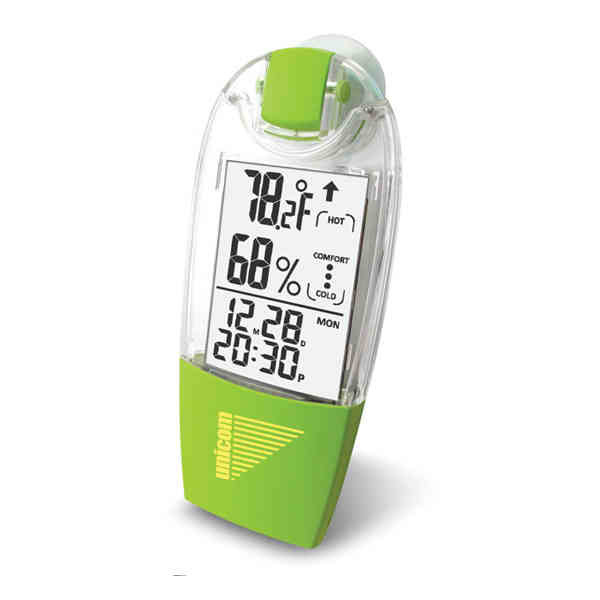 Your next promotion can harness the power of the sun with this compact, eco-friendly solar powered thermometer! Versatile enough for most climates, it can read both degrees C and F ranging from -13 F to 139.5 F. It records daily high and low temperatures and has temperature trend up/down indicators. The suction cup on the back means that this tiny thermometer is perfect for cars, homes, offices and more. Simply add your company's name, logo or advertising message before handing it out at tradeshows, expos, conventions and any other promotional opportunities to spread the word about your services and extend your brand's reach! Size: 2 15/16 " x 1 9/16 " x 3/4 "